The Pushkin Museum of Fine Arts invites you to the exhibition "The 6-7th Century Mount Sinai Icons From the Collection of Bogdan and Varvara Khanenko Museum of Fine Arts, Kiev". The exhibition will last till 3 March, 2002. The three represented icons are from the Monastery of Saint Catherine in Mount Sinai. 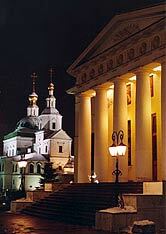 This Monastery in the course of time became a real treasury of Christian art works. The 6th century icons are the most ancient examples of icon art we have for the present moment. They were painted with molten wax paintings on a wooden base primed with plaster. The usage of this technology helped them remain in such a good condition.